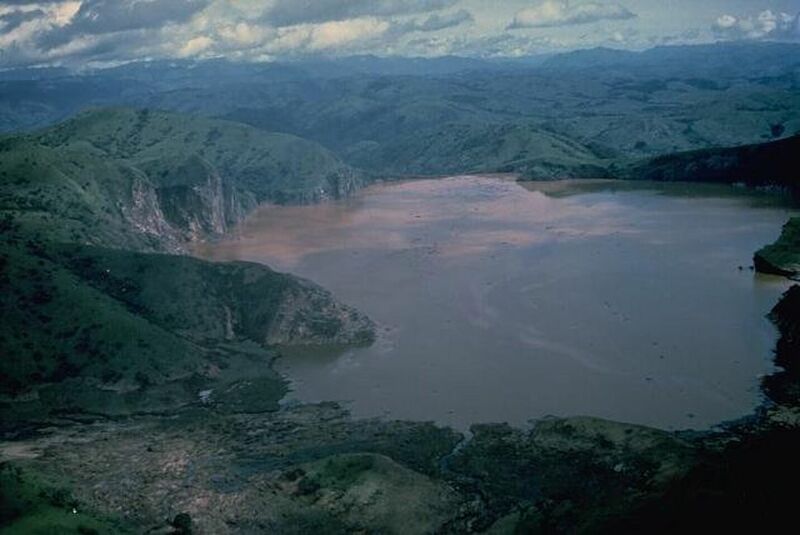 On August 21, 1986, a cloud of toxic gas erupted from Lake Nyos, Cameroon. Lake Nyos, Cameroon, was the site of an horrific gas eruption in 1986. Fumes from the underground volcano suffocated more than a thousand local residents and devastated the livestock industry. On August 21, 1986, a cloud of toxic gas erupted from Lake Nyos, Cameroon. Lake Nyos is a lake that developed in the crater of an inactive volcano. Lake Nyos absorbs carbon dioxide that sometimes leaks from the volcano below. In 1986, this dissolved carbon dioxide erupted from Lake Nyos, a natural hazard called a limnic eruption. The toxic gas spilled over the crater's rim and flowed into villages in the valley surrounding the volcano. About 1,700 people and 3,500 livestock suffocated after breathing the deadly gas. Following the Lake Nyos disaster, scientists put large pipes in the lake, leading from the lake bottom to above the surface. The pipes allow carbon dioxide to escape as soon as the volcano releases it. The small amount of gas, piped out continuously over time, is not enough to be dangerous.